3' cable costs $32.35. These cables will come in Black/Red or Gray/Red depending on what is in stock at the time. Click on drop down menus below to choose lengths and other options. 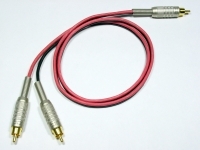 This cable features the Canare F-10 Gold Plated RCA's, with cable strain relief. For functionality or to lower the cost you can substitute the Calrad RCA's on the dual end.